Back in the early 80’s when microwave popcorn was all the rage microwave ovens were still a little expensive and were not ubiquitous yet. Fortunately there were a few regional popping centers that picked up the slack. You would place your bag of unpopped corn into the pre-paid mailer and send it off to the nearest center. They were outfitted with large commercial ovens that could handle 4 bags simultaneously. Your freshly popped bag would be placed in a foil lined box and immediately shipped back to your location. If you timed it right the bag you sent out on Monday would get back to you just in time for the Friday night movie. Canada! Come see me this weekend at the free Toronto Comics Art Festival! I prefer air-popped myself. Microwaves always burnt too many until I finally went and got my own little air popper machine. Do I feel my leg getting pulled, or did I step into a gopher hole again? @ Kree: It took me a while to learn this, but you’re supposed to stop the microwave before the fire alarm goes off. I lost 5 jobs before I got that one right. NO WAY did something like that actually exist. I call shenanigans!!!! I second the call on shenanigans! Lucky for Biff he has detatchable body parts. But won’t he get bored in the box? Did he pack something to read along the way? And if so, how will he turn the pages? wounder if biff is getting his teeth checked for any popcorn kernals stuck in his teeth. Of course, Jiffy Pob on the stove was immediate gratification, and it wasn’t stale by the time you ate it. MaskedMan- His eyebrows would be able to turn pages. Or he could use his tongue. Great comic today Chris! I too have trouble popping popcorn, even in one of those air-poppers. You can pop corn in just a regular paper bag for less than 50¢ a bag, if you buy in bulk. 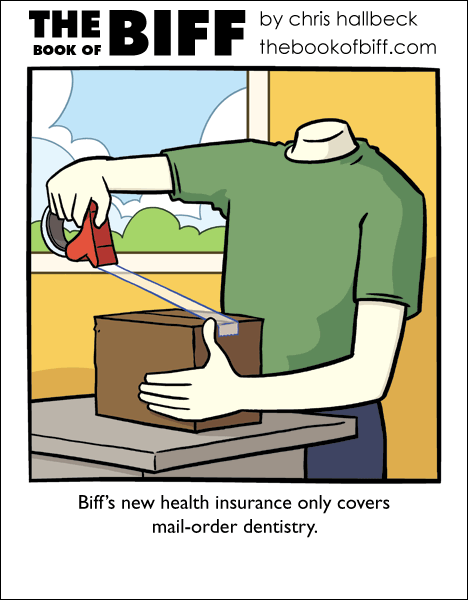 My insurance doesn’t cover any kind of dentistry. My mouth is $15,000 of extensive work. I would have to sell baked goods to support myself. I live in the Seattle area and the dentists I see love me for some reason. I think it’s because I inherited a British smile.